So, it’s June and the magazines are already talking about the best Christmas presents for this year. Any ideas what may be a massive theme to Christmas this year? A mythical animal that exudes happiness, positivity and glitter? One that little kids are going crazy over? I am so on board with Unicorns. It’s a craze I am all for. And beauty brands are getting involved too! 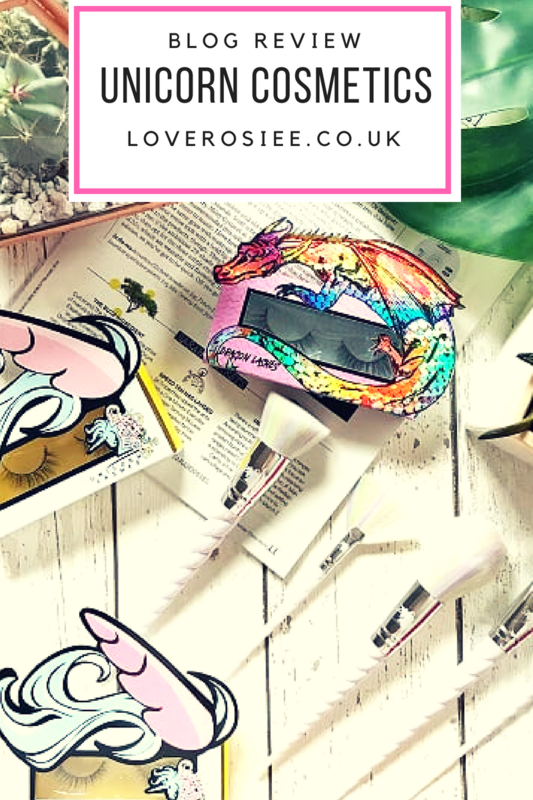 Namely, my FAVOURITE Make Up brand – Unicorn Cosmetics! 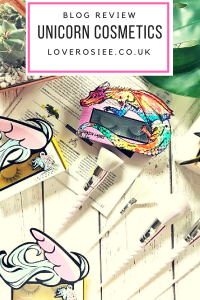 I have fallen totally in love with Unicorn Cosmetics and I cannot believe that little old me nabbed a collaboration with them! So, here goes! First of all, let’s just cover packaging GOALS! Everything from Unicorn Cosmetics comes in the most beautiful wrapping, boxes and packaging and I am so here for that! When shopping for this post I was so sure of what I wanted to feature but as soon as I went shopping with them I changed my mind 387574 times! We all already know how much of a lash addict I am and I’ve only ever heard amazing things about Unicorn Cosmetics lashes so that was a no brainer. Then I was naughty. We all know, as a beauty blogger, that I already have lots of sets of make up brushes. It’s par for the course of blogging, you try all these things out. But when I saw the Unicorn Brushes I just HAD to have them! And I have not regretted that decision! Make up brushes can be either end of the spectrum – they can go so so well or very badly. I’ve had some terrible rashes break out due to vigorous make up application using terrible, rough, cheap brushes. But then I found the Unicorn set and my face has never thanked me more! 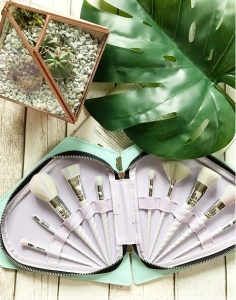 The brushes are so soft and fluffy while still having that ability to grab hold of the product and spread it evenly over your face! The brushes are some of the best I use and I have received so many compliments on how my skin looks when having used the brushes to apply both a full face and a general day to day look. Another added bonus is that they are really quote hardy! I’ve washed them a few times to try and be a good beauty blogger and they are so sturdy and don’t damage at all from rigorous washing, lathering, soaking and drying all just to be dunked in make up all over again and used. The original fluffiness and luxurious feel is still there with all the brushes and I’m about four washes in! If that’s not a win, I don’t know what is! Now, let’s talk lashes. It’s no secret that I am massive fake lash fan! I am also a fake lash snob! In my opinion, you can go so wrong with lashes – they can be too big, too small, ill fitting and well, make you look silly. Once upon a time it was the fashion to have the huge TOWIE style, well in your face lashes but now beauty has evolved. You can get full lash lifts and tints as well as lash extensions which are amazing. So, why go full TOWIE on us!? And as much as the beautiful lashes from Unicorn Cosmetics look a bit scary, they are dramatic while still being demure, good quality and not too over the top! The lashes themselves are super soft while still being strong enough to hold their form while I flap and try to get them on without sweating the rest of my make up off! 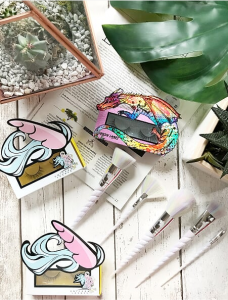 The Unicorn and Dragon set from Unicorn Cosmetics are some of the BEST lashes I’ve ever been fortunate enough to try out! I rely on them and use them for all sorts of beauty days – maybe not a day at work because LOL if you were to see me at work, I look like a troll! But other occasions like pub garden time for Sun downers, boozy BBQs and parties.. they have lashes literally for every occasion! I implore you to invest your beauty pennies with Unicorn Cosmetics! Absolutely love Unicorn Cosmetics! Their products are amazing! I have purple unicorn brushes and the are my favourite! This is so cute! I LOVE the packaging. Oh my those brushes are so pretty! And glad to hear they’re super soft too! The case they come in is so handy too, would make travelling with makeup brushes much easier! I really love the unicorn lashes. They’re so lightweight and pretty ! omg the brushes look and sound amazing! I am in need of some new brushes to be fair, so I’m heading over to their site right now!